£11,896 was raised by 416 supporters — that's teamwork! WHAT IS 20TH CENTURY FLICKS? 20th Century Flicks has been providing the city of Bristol with videos, DVDs, recommendations and warnings for over 30 years. We are one of the last standing independent video shops, with the largest collection of films available to the public in the UK. We are looking to expand and improve the service we provide to our community. This involves moving to a larger premises nearby and transforming into not only a video library and a place to buy films and movie-related goodies, but also a screening venue and coffee house. We are working hard to ensure the new Flicks becomes a key fixture in the Bristol film scene, building on its already fearsome reputation. Well, I'm David Taylor, a 35 year-old male with scruffy hair and a particular fondness for American independent cinema from the 90s. I live on a boat in Bristol harbour and have two goldfish. I also have an alarming ability to recall film index numbers without referring to the computer; information which has presumably replaced important memories from my childhood. Then there's David White. He's an 80s Hollywood cinema expert with a closely-groomed head and glasses. He recently became a father and looks forward to raising his daughter in the manner of a Spartan warrior. We're not all called Dave. Adam Hart is an itinerant hobo who has nonetheless managed to remain in orbit of the video shop the past two decades. He has little time for Hollywood, preferring tales of underdogs from far-away places. He is also our main reviewer and his dry summations are often key deciders in what our customers end up taking home. We need a bigger boat! It's obviously not a decision we've taken lightly as Richmond Terrace has been our home for over 30 years. We're deeply entwined with the local community, but we need more space to house our stock and to enable us to diversify. You'll be able to drop in and watch a movie with your friends, use the wifi, have a snack or a drink and chat with other movie fans while browsing our collection. The days of every neighbourhood having their own video shop, which is what we were to Clifton, are sadly over. Now we're the only one in the city, so a more central location is called for. Also, it's a sadly familiar story: the level of rent we pay for our current premises is unsustainable, and this year it has been increased by 20%. We'd either have to close up, or rob a bank. The former is unthinkable, and we've watched too many heist movies to think that doing the latter could end in anything other than tragedy. "Parking's a nightmare there!" A lot of people are concerned that they won't be able to continue using us if we move to the Christmas Steps, due to parking restrictions and accessibility concerns. We will address this with a Movie Safe at the top of the Steps. You'll be able to pull up, drop your movie in the box and bez off. If you're picking one up, you can phone ahead and we'll leave it in the safe for you, having let you know the passcode for that day. This is also the case for those with accessibility problems. There are plenty of parking bays nearby so finding a nearby space should be easy. Obviously you'll have to pay for this, but that's soon to become the norm in Clifton too, with the introduction of the RPZ scheme. Cyclists and pedestrians will be better off. One less hill to climb on your visits to us! Plus there are good bike parking provisions at the top and bottom of the Steps. We will be renting and selling films. All of our stock will be available to rent or buy. Don't worry, we'll replace the films we sell, maintaining and growing our catalogue of over 18000 films. It will become the go-to place for anyone who wants a particular film, whether to rent or buy it. We will be creating a small cinema. As some of you know we created a cinema room in our current premises, The Flicks Kino. 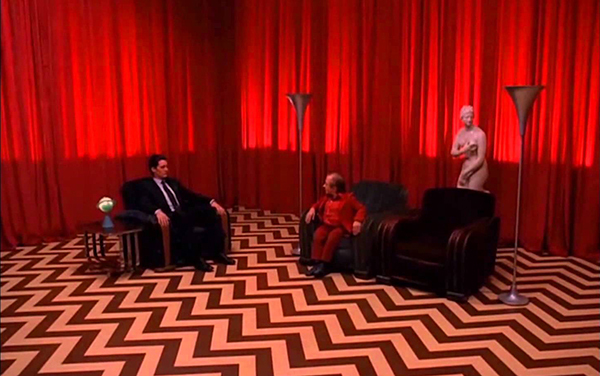 It's proven a popular initiative, so we're going to be extravagant and recreate The Red Room from Twin Peaks! Everyone will be able to use the space for their own screenings and discussions and we hope it will become a unique haven for cinephiles in Bristol and beyond. We will be selling film-related merchandise. Badges, cards, posters and t-shirts and a whole bunch of other stuff that we're sourcing from creative types in and around Bristol. We are creating the infrastructure for an online streaming service. Fed up with the lame choice Netflix and other streaming services provide? We are working towards the creation of a superior service, bringing the hard-to-find movies and overlooked gems that have made us famous to as wide an audience as possible. Our computer guru Techno Jesus (aka 'Jim') is working pro bono in order to bring this ambitious project into existence. A lot of work we're putting in ourselves free, whilst using our precious capital to employ local builders and artists to ready the new place. 'The New Place' is what used to be SHOP on Christmas Steps. It's a beautiful building and is perfect for our plans. It needs refitting to suit our purposes and though some of this we can do ourselves, we'll need materials and craftspeople to help achieve this transformation. This is why we're asking for your help. There are some other things we can't immediately afford that our key to our plans; things like a projector, a sound system, a coffee machine, computers, paint, shelving, lighting, seating and tables, a server to host our streaming service... The banks aren't interested in funding a Video Shop in the 21st century. 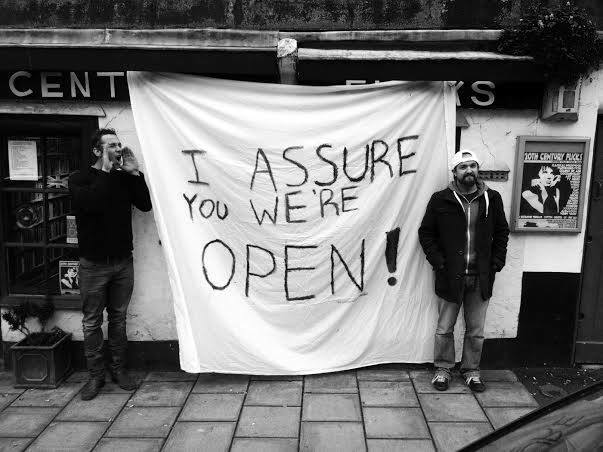 They don't get it, but our customers DO! It's important for Bristol that we stick around. Generations have grown up with us and we don't want to fade out like so many other indie record and video shops. 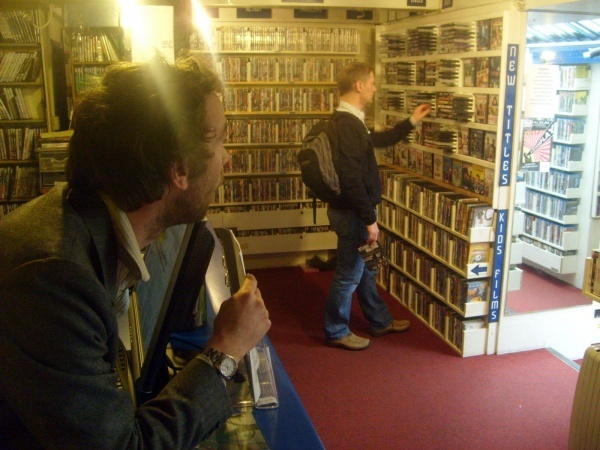 While movie-watching habits have moved online, we're here to remind people that nothing beats the experience of choosing a film in a video shop, and having someone to talk it over with. That's why we need to diversify. We've taken the 'traditional video shop' format as far as it can reasonably go in the 21st century and now we're reaching for something bigger, better and more sustainable. So, help save the day and ensure the future of an iconic institution! We've been around for over 30 years and we want to be here for you for many more to come. If you can help us, you'll be able to tell your grandkids, "See that beautiful place? I helped make that happen! Let's go rent a movie..."
I'M BROKE. I CAN'T HELP YOU. Nonsense! If you don't have any spare money, there are still lots of ways you can help us make this thing happen. 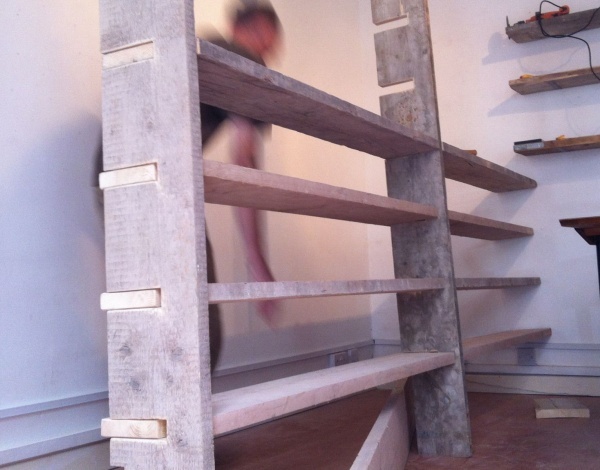 Donated furniture, tools, paint and brushes, art, labour or expertise... It all helps! So please get in touch if you want to be involved in the move. Email us at info@20thcenturyflicks.co.uk. Video shop rewards await, as well as a coffee and a warm welcome. Free membership. A shout-out on our Facebook page. A free limited edition 20th Century Cube postcard. Free membership! A free rental! A free coffee! Limited edition 20th Century Cube film postcard and a poster! We will reenact a scene of your choice (for or with you) from any Kathryn Bigelow* film. It could be anything from a simulated foot-chase culminating with you firing your gun into the air in frustration, to you waiting tables in a dead-end job when a load of greaser bikers roll into town. You would also be given a coffee & a free rental. Free membership! 3 free rentals! A free coffee! Limited edition 20th Century Cube film postcard and a poster, plus a badass 20th Century Flicks tote bag. A 20th Century Flicks t-shirt! Free membership! 5 free rentals! Free membership! 10 free rentals! A screening of a film of your choice for you and your buds in the Kino! Invitation for you + 1 to our Opening Bash! Old school membership card (only 40 left in existence!) A Flicks t-shirt and tote bag! 20 Free Rentals! Your very own 'Favourites' category on our website. Invitation for you + 1 to our Opening Bash! Personalised 'Flickster Saviour' t-shirt! Old school membership card (only 40 left in existence!) Your own 'Favourites' category on our website! Private screening of a film of your choice for you and your buds! A dedication plaque in the Kino! 100 free rentals! Invitation for you + 1 to our Opening Bash! Personalised 'Flickster Saviour' t-shirt! Old school membership card (only 40 left in existence!) Your own 'Favourites' category on our website! Private screening of a film of your choice for you and your buds! A dedication plaque in the Kino! Invitation for you + 1 to our Opening Bash! 250 Free rentals!